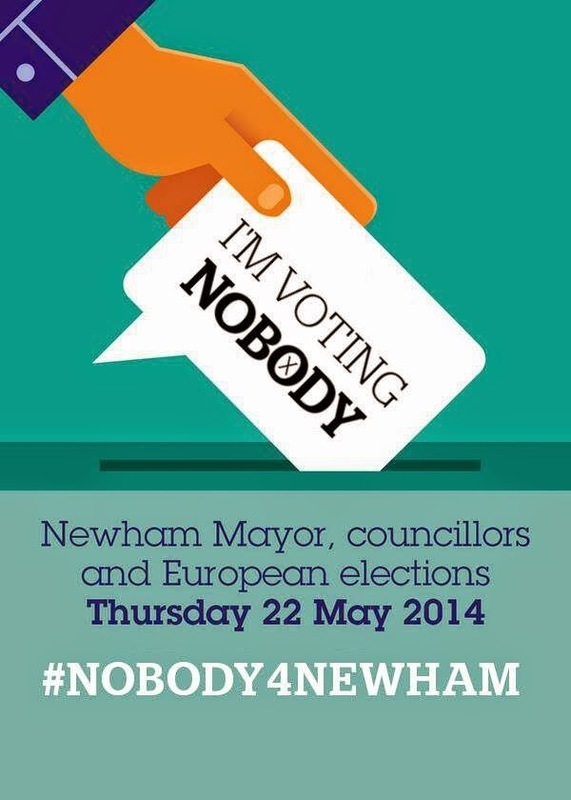 The local elections In Newham are over and the result, once again, is No Overall Surprise: Sir Robin Wales is back as Mayor after 12 years in power and every councillor is still a Labour representative. The NPA's political journey from endorsement by "left-wing" MP George Galloway to an alliance with the party of bankers, private equity managers and Old Etonians has been an object lesson in breathtaking political opportunism. The willingness of the Tories to at least tolerate vile homophobic messages and deliberate religious sectarianism by its new allies offers another lesson too, about what happens when you enter into what I shall mischievously call a "civil partnership" with reactionary communal interests in the borough. But the situation facing the left alternative in Newham isn't really anything to take comfort from: the combined Mayoral vote for the Greens and the Socialist Party dominated TUSC was just 4763 (6% of votes cast) and nothing screams "there's no serious left alternative" like the latter's seventh place behind pretty much everyone, other than the mercifully deceased Christian Peoples Alliance. I was one of those who, faced with a Green Party 'paper candidate' and a Trot group parachuting in with the hope of recruiting some new members, decided not to vote on Thursday. For this sin, someone on Facebook said in a private message that I was providing "succour to the racists in UKIP". In the circumstances, unfriending him was the very least I could do - a punch in the canister seems more appropriate - but it is systemic of a irritating fetishism about the electoral franchise that I find simply incomprehensible. For leftwingers, voting is tactical and like all tactics, its value lies in bundling it together with other tactics into something resembling a strategy. Organising a national demonstration in central London, for example, in order to galvanise a growing movement or motivate supporters in advance an crucial date or decision, makes complete sense. On its own, it's just another stroll through town. The same applies to voting: if there's a growing momentum for radical change, either locally or nationally, then maybe it's a potentially useful tool. Of course all the other tactics, like building local support and engaging the wider public, take time: at least four years or, if UKIP's trajectory is any indicator, more than twenty. That's why it's tempting to skip these tactics, but on its own, voting turns out to be an ineffective waste of time and resources. No matter how they try to spin it, the Greens and the TUSC in Newham have demonstrated how having no strategy just shows up the chronic weakness of the left locally. There is still hope. Others, like the new Left Unity party, do seem to understand that short cuts simply don't work. But in Newham, creating a progressive alternative in 2018 to the political bankruptcy of both Robin Wales' Labour and the kind of faith based opportunism that backed the Tories probably needs to start immediately. I'm happy to leave this to others: I'm hoping to get out of Newham before Sir Robin Wales' next re-election in four years time, when I suspect the cohesiveness of the borough will have been finally destroyed by slum landlords, vicious cuts and more of the kind of nasty, reactionary communalism we have seen over the last few weeks. Anyway, to borrow from a very old joke, "if you want to find your way there, you really wouldn't want to start from here".